our apricot & almond oat-ola is a handmade granola made from nutritious organic oats, chunky almonds, seeds and juicy organic apricots. lightly spiced, then coated with coconut nectar and toasted to perfection! with a generous dollop of yoghurt! See our website for some more inspiration recipes and serving suggestions! ingredients: organic rolled oats (53%), nuts (almonds (12%), organic coconut), coconut nectar (coconut neera, calcium carbonate), NZ cold pressed extra-virgin rapeseed oil, pumpkin seeds (7%), organic sulphite-free apricots (7%), spices, rice flour (coats apricots to prevent sticking), sea salt. 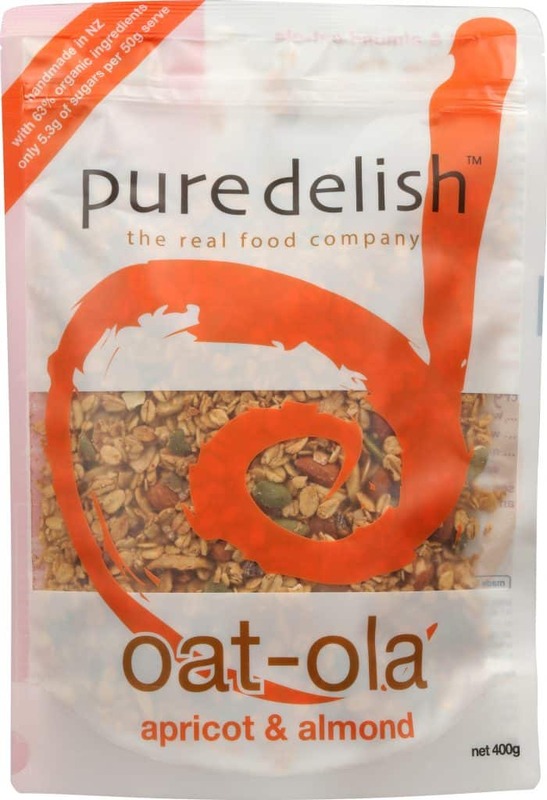 contains oats, tree nuts and gluten. may contain traces of wheat, barley, rye (from oats).